Dragon is struck by a blast that burns off parts of his broken limbs and leaves him even more injured than he already had been. Dread Knight starts to explain his recent actions, beginning with recognizing voting irregularities during the 2002 elections. He studied the Diebold voting machines and discovered that they were easy to hack. In his civilian identity of Ronald Winston Urass, he was going to exploit the machines’ weakness as well as Dragon’s popularity to claim an election victory. 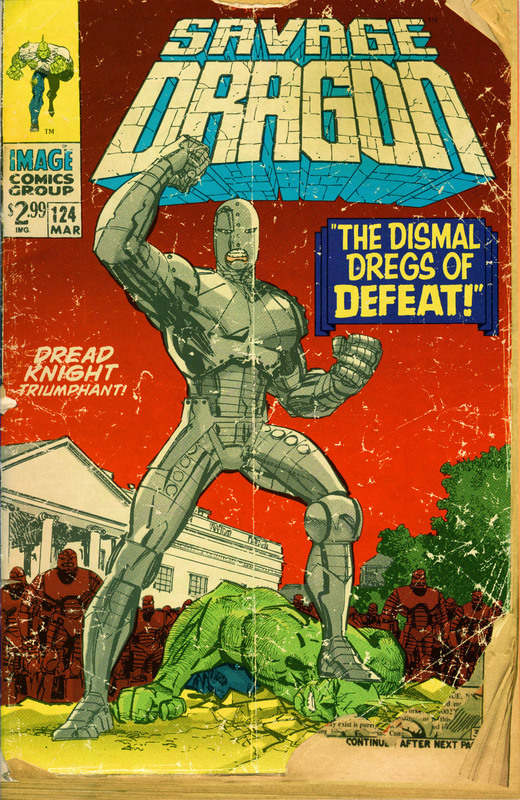 The fact that Dragon ended up somehow ruining his plans has left Dread Knight enraged and he has now led his army of Dreadhead robots to carry out a coup d’état. They surround the White House in preparation of seizing power of the United States. Dragon points out that even if the villain is successful no one is going to allow him to maintain power. There will be countless heroes and other people out to eliminate him and the idea is laughable. Dread Knight reacts angrily to this claim, completely shooting off the damaged limbs of his enemy. He rants about how President Bush is insane and has been leading the United States in igniting a global war that could lead to the destruction of Earth itself. Dragon has finally had enough of the villain and, despite his various injuries, launches an attack upon Dread Knight. Meanwhile, Flash Mercury comes home with some groceries for the Creator and wonders if he could be guilty of aiding and abetting his employer. The Creator had recently been broken out of prison and Flash does not wish to get into any trouble. He only wants to be a superhero but owes the Creator for granting him mobility when he had been paralyzed. Flash discovers the corpse of the Creator and celebrates his newfound freedom. Mister Bug is visited in his apartment by his landlord over late rent payment but the would-be villain has no intention of paying. He uses his Bug Belt for the first time and transforms Mr. Finkleberry into a talking fly before swatting the insect to death. Alex Wilde is given a lift by some fellow police officers to the White House where she slowly makes her way through the Dreadheads. The robots ignore her progress as they do not detect that she is a threat to them or their master. She locates the limbless SuperPatriot and is instructed to bring pieces of his cybernetic arms and legs to him so that he can mentally rebuild himself. He then notes that Dread Knight’s armor was the prototype for OverLord’s which gives Alex an idea. The frustrated Dread Knight prepares to execute his failed running mate but Dragon points out that his armor likely has the same weaknesses that OverLord’s did. Alex had helped SuperPatriot get an arm functioning again and he fires his weapons in the specific sequence that would shut down most of the systems in Dread Knight. Alex then dons the power gloves and joins Dragon in pummelling Dread Knight in between shots fired by SuperPatriot and the nearby soldiers. With little choice but to surrender, Dread Knight gives up and is taken into the government’s custody. Dragon is surviving from his wounds well enough but he is concerned just what his wife will be thinking about him now. After the explosion of Nuclear Man, Mighty Man’s fate is finally revealed as he crash-lands down on Earth. After successfully removing CyberFace from power, the new Liberty League explores the dungeon where the fallen despot had kept his most dangerous prisoners. They discover countless corpses belonging to both heroes and villains that could have threatened CyberFace’s rule. Some of those killed are major players and the Liberty League figures that an army must have been responsible for all of these deaths, a theory quickly disproved when the true guilty party reveals himself. Joey Finkleberry proudly claims responsibility for the majority of these deaths and an angry Battle Tank attempts to bring him down but is easily batted aside. SuperPatriot uses a sonic assault to disorient the young killer but a roof is brought down on his head to halt this weapon. Dragon whispers something to Mighty Man before addressing Joey, pointing out that now CyberFace is gone that he will spend the rest of his life on the run unless he surrenders. This warning is ignored by Joey who claims that with CyberFace dead that he is the most powerful person on Earth and should rule instead. Mighty Man swoops down and carries Joey up towards space but his captive struggles free and is dropped back down to the Earth. Mighty Man announces that he lost his foe but Dragon does not mind, at least they cleared him out of the dungeon. The Liberty League then set about cleaning up the mess left behind.